While you may not follow movements in the bank bill swap rate (BBSW), right now they are worth paying attention to. You see, rates are on the rise. And that means the funding costs for our major banks are also going up. This could force them to raise mortgage rates – and take mortgage stress to another level. 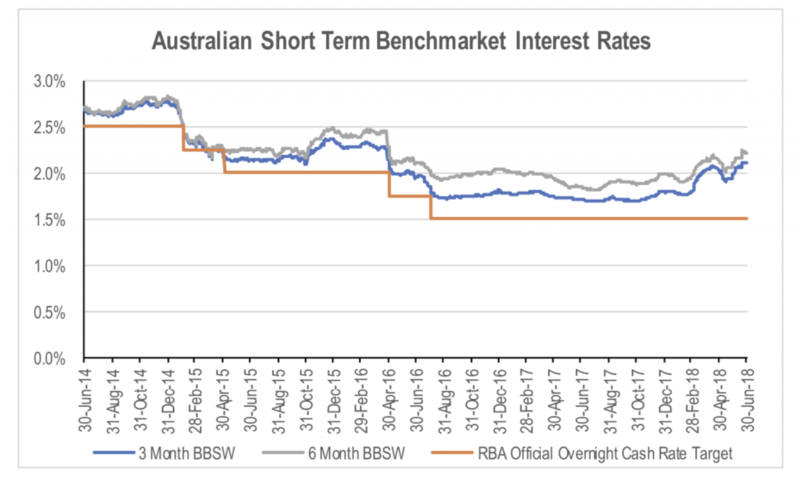 Over the last six months, we have seen a significant rise in short term benchmark funding rates in Australia despite there being no change in the RBA’s official overnight rate. This has material implications for the banks, not only because of the signal it is potentially sending the market, but also due to the impact it has on bank funding. Bank bill swap rates are the reference rates used for most wholesale (i.e. non-deposit) bank funding. They are set on a daily basis with maturities ranging from 1 to 6 months. The most commonly used reference rate is the 3 month BBSW rate. Over the last 4 months, the 3 and 6 month BBSW rates have risen significantly relative to the RBA’s official overnight rate. With most of wholesale funding rates set as a margin over the 2 month BBSW, higher BBSW rates mean higher funding costs for the banks. This can occur for a number of reasons. The most common reason is as a result of the BBSW rate reflecting the market’s expectations of future rather than current RBA rates, while the RBA rate is a one day rate. If the market believes the RBA is likely to increase rates imminently, BBSW rates will increase relative to the RBA rate. Over the last 20 years, there have been 15 periods in which the 3 month BBSW has been more than 0.5 per cent above the RBA’s official overnight rate. In all but 2 of these instances, the widening of the spread occurred ahead of an RBA rate increase. In other words, the increase in the spread reflected the market’s prediction for a near term rate increase by the RBA. The two times when the increase in the spread did not precede an RBA rate increase were during the GFC between February and July 2008 and now. Given that the BBSW rate also incorporates a credit spread for the major banks on short term funding, the tightening of liquidity and rising default risk during the GFC meant the banks had to pay a higher than normal premium to access wholesale funding. There have been a number of explanations offered for the increase in BBSW rates relative to the RBA official rate over the last few months. These include the impact of changes to US corporate tax laws that have allowed US corporations to repatriate the billions of dollars of cash that was previously trapped overseas. The repatriation of this capital has resulted in a material withdrawal in capital that funded overseas corporate credit markets. Irrespective of the reason, the implication for the major banks is that funding costs are on the rise. This will put pressure on net interest margins, with those banks that are more exposed to wholesale funding likely to feel more pressure than those that are more reliant on retail deposits. 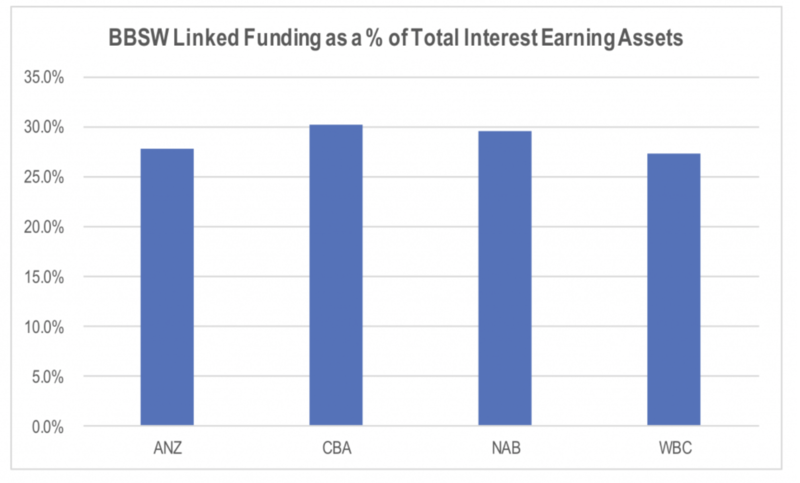 If we compare the major banks in terms of the proportion of total interest earning assets that were exposed to BBSW linked funding by either group debt of Australian certificates of deposit as at the last reporting date, the exposure is fairly similar. This says that a 35 basis point increase in the average 3 month BBSW spread relative to 1H18 would add around 10 basis points to average funding costs if it all flowed through to wholesale funding costs. The impact on net interest margins is reduced given some business lending rates are linked to BBSW, providing an offset to the impact on funding costs. The problem is that mortgage pricing is not, at least in the mind of the consumer. This creates a mismatch between bank funding costs and asset prices for mortgages. As a result, we have seen a number of smaller banks lift mortgage rates in recent weeks. These include BOQ, IMB, Citibank, Bank SA, and ME Bank. The pressure on the majors is no doubt rising, but the political ramifications of lifting mortgage rates while the RBA holds official rates flat is likely to be holding them back. In the meantime, shareholders are footing the bill from higher credit spreads. The added risk for near term margins is that higher wholesale funding spreads could trigger increased competition for retail deposits, given that retail deposits have effectively become a cheaper form of funding on a relative basis. To date we have not seen any material change in deposit pricing, but it is something to watch out for given the additional impact this would have on net interest margins for the industry.